#1 It’s SUPER easy, fast and cheap! #2 My meat eating hubby LOVES it! #4 It’s perfect to take to a potluck and is good cold or hot! #5 Left overs are soooo yummy – it’s actually even better the next day! Serve over cooked rice or quinoa. We also love it with papadums! I also add raisins to mine –because I love the savory curry with sweet raisins! 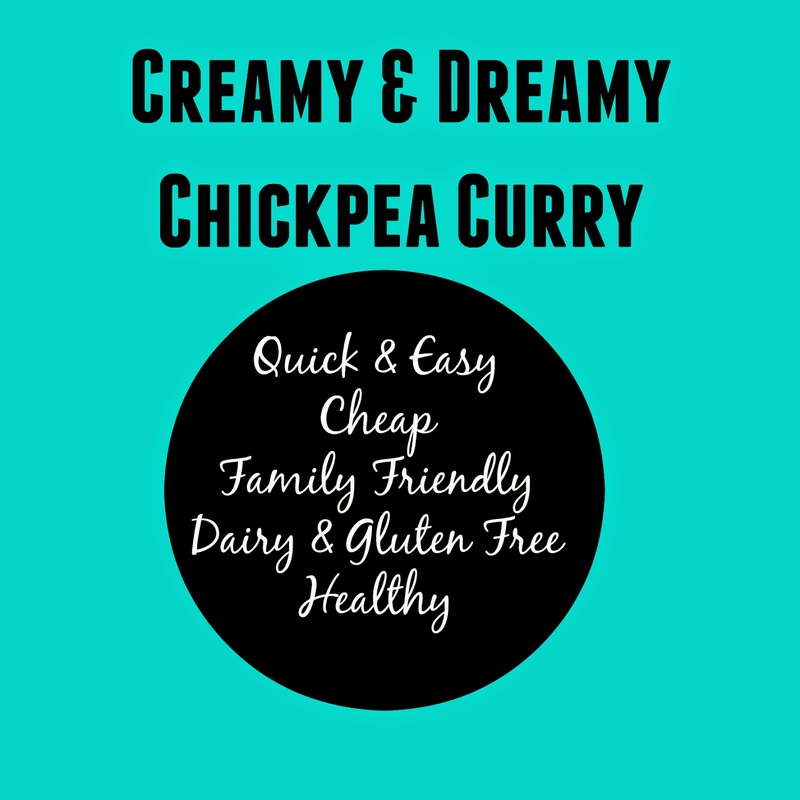 Add chickpeas and coconut milk to a pot and simmer for 10 minutes (helps soften up the chickpeas a bit) add in bullion cube and curry powder. About 5 minutes before serving add frozen peas and spinach! Serve!!! *you may need to add extra curry powder! I have 2 different kinds and one I add a TBSP and the other I have to add 3 TBSP! That’s all – I said it was easy!! Please note if serving to little people – the curry powder stains clothes – so I usually give F his when he’s just in a diaper! have you ever tried this without the bullion? it sounds great, but i dont use it. i havent found one that is vegan, and isnt mostly sodium...thoughts on a replacement? You could totally take it out! It does add some saltiness and a little sweetnesss. Maybe add a little nutritional yeast and some sea salt! went heavy on the curry powder and added 2 tbsp nutritional yeast. wish i could post a pic. its beautiful. Love it!! Post a pic on my fb page!!! Would love to see! https://www.facebook.com/dairy.free.betty Hopefully you loved it! I love this dish!! Thanks so much for bringing it to our potluck! Its Amazing Dish.I like it.Thanks for sharing.